The Dashboard offers a snapshot of items that can be actioned. Clicking on action cards brings you straight to the corresponding item. The Dashboard displays items that are relevant to the user viewing it at the time. 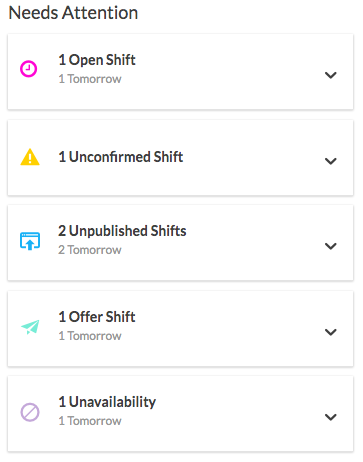 From here, your shift information for the day is displayed, from which you can start and end your shift. The Dashboard can be accessed via the 'Me' tab. 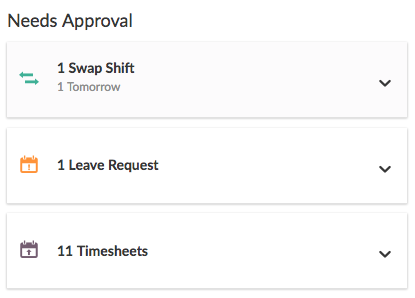 Below is an example of the dashboard in action. Note: All cards in the dashboard are clickable. Clicking an item in the collapsible card will bring you to the corresponding section within Deputy, for example. Additional note regarding permissions/access levels: The Dashboard is based on permissions. It is only visible to System Administrators, Location Managers, and Supervisors. The viewable cards are based on what you have access to in Deputy. New Unavailability - Displays any new set unavailability in the system. Note: Needs Attention primarily focuses on items that are relevant for the week, based on your set Starting Day (as set in Location Settings). Notes: This section will show data from all-time that need to be actioned. Showing and hiding the dashboard is simple. Click the Arrow icon to collapse or reveal the Dashboard. If you have changed any data and the Dashboard does not immediately reflect the data changed, you may need to refresh the Dashboard. To do this, simply click the Refresh icon as shown below.